This should be the most wonderful time of the year for Toys "R" Us. Instead, the ailing toy store chain, which filed for bankruptcy in September, is staving off reports about imminent store closures. "We are working on a real estate strategy right now that's a work in progress," CEO Dave Brandon said Thursday on the company's quarterly earnings call. All buzz is "pure conjecture," he added. Earlier this week, Bloomberg reported that Toys "R" Us is considering closing at least 100 U.S. stores in the face of flagging holiday sales. The company currently has about 880 stores across the country. Closures or not, Brandon said the brand has been working through a "very difficult time." "We continue to experience a significantly challenging retail environment," Brandon said. Same-store sales fell 4.4% last quarter, which ended October. In the U.S., same-store sales were down 7%. In the wake of the company's Chapter 11 bankruptcy filing, Toys "R" Us has had to contend with lost consumer confidence and strained vendor relationships, Brandon said. There was even a temporary interruption in shipping that hit inventory. Then there's the baby problem. Much of the growth in baby product sales is online, Brandon said. But there's an enormous amount of pressure in that environment to bring down prices, making slim Babies "R" Us margins even slimmer. Sales of learning products have also been weak, Brandon said. 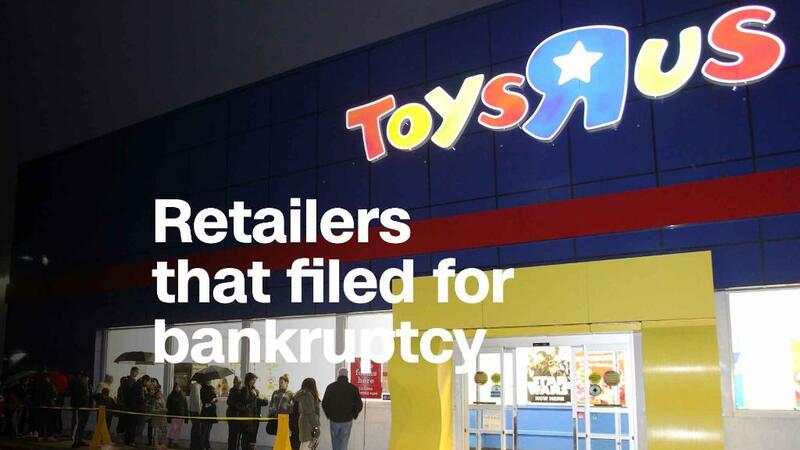 Toys "R" Us is part of the long list of retail companies that have declared bankruptcy this year, including children's clothier Gymboree, teen chain Rue21, Payless Shoe Source, RadioShack and The Limited. Like other retailers, it's wrestled with declining foot traffic amid the online shopping boom ushered in by Amazon (AMZN). But Toys "R" Us is also up against other headwinds in the toy industry. Lego and Mattel (MAT), some of its top suppliers, have been working through a tough time themselves. Increasingly, many children are playing games on consoles, tablets and phones -- hitting demand for some of the action figures, dolls and play kitchens kids turned to in the past.